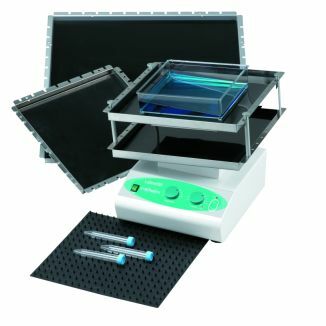 The three dimensional shaking motion of the GyroTwister GX-1000 is extremely efficient, yet gentle, making this shaker ideal for general mixing as well as staining gels, hybridization and other applications. Shaking speed is continuously adjustable across a broad range. A nonslip rubber mat and elastic tie-downs hold samples in place during operation. A dimpled mat is included for holding tubes in place. Larger platforms and a stacked standard platform configuration are available to increase shaker capacity. Permanently lubricated ball bearings on moving parts provide quiet, maintenance-free operation. The sturdy base lends stability to the unit. The GyroTwister is safe for use in temperature controlled environments, up to 65°C. Standard 30 x 30 cm platform and tube mat are supplied with the shaker.